As I told you can use the Double brace initialization to create HashMap with values. Btw, this is not a very good pattern, in fact, it is considered as an anti-pattern in Java, but if you are doing this just for utility or testing purpose than it's ok. This idiom internally uses the instance initializer of Anonymous inner class and cost an extra class every time you use it, but you can use it to initialize both static and non-static HashMap as shown in our example. Another drawback of this idiom is that it holds a hidden reference of enclosing class which may cause the memory leak in Java application. The good thing about this idiom is that It requires less code i.e. you don't need to create HashMap without values and then subsequently call the put() method, but you can both create and initialize the Map in the same line. You can also use double brace initialization with LinkedHashMap, TreeMap, ConcurrentHashMap, and Hashtable, in fact, with any Map implementation e.g. EnumMap and WeakHashMAp. Here is our sample Java program to create and initialize the HashMap in the same line. In this example, we have used the double brace initialization idiom to initialize both static and non-static HashMap. If you look our program, you will find that we have a map called squares which are supposed to contain the number and it's square. This HashMap is initialized in the static initializer block. Then, we have another Integer to String Map called IdToName, this is also created and initialized at the same line. * Java Program to show you can initialize a HashMap wit values in one line. * You can use this technique to initialize static Maps in Java. 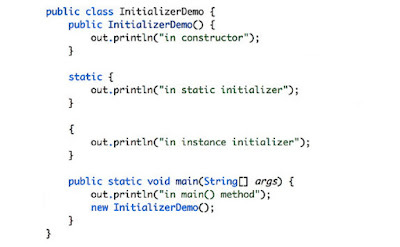 2) Instantiation and initialization in the same expression. 1) Not very readable. This idiom internally uses the Anonymous inner class, which is not clear by just looking at it. 2) It creates a new class every time you use this pattern to initialize HashMap. 3) It holds a hidden reference of the enclosing instance, which may cause the memory leak in Java application. That's all about how to initialize HashMap in Java in one line. You can use the double brace initialization pattern to create HashMap with values but beware of all the disadvantages associated with this idiom. It's good for testing and demo purpose but I don't advise you to use this technique in production. Instead, load data from database or config file.